Our compelling template consists of a design of two golden keys with business words. This image depicts the business concept. Adjust the above image in your PPT presentations to visually support your content in your Leadership and teamwork PPT slideshows security, strategy and success. Create captivating presentations to deliver comparative and weighted arguments. Take on the banter with our Golden Keys With Business Words PowerPoint Templates And PowerPoint Themes 1012. They give you the advantage in any argument. 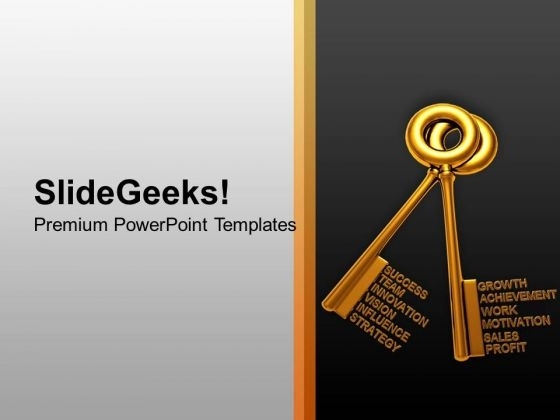 Our Golden Keys With Business Words PowerPoint Templates And PowerPoint Themes 1012 are driven by excellence. They automatically attract the exceptional.